How long? the Psalmist asks God. He didn’t ask politely. It was with a lot of feeling. Probably yelling and crying and weeping. Like crying on the floor of a hospital bathroom when a loved one is sick….or weeping beside the body of a person who has just died. The writer of Psalm 13 is expressing giant emotions and giant grief. He asks, How long will you forget me? How long will you hide from me? How long will my heart ache all day long? It’s a Psalm of lament – which means big, sad feelings. There are several dozen Psalms of lament in the Bible. Some are individual laments and some are communal. Today’s reading - Psalm 13 - is an individual lament. The author is not filtering his feelings. He’s not editing them or making them quiet or nice. He’s not pretending to be “fine” or “okay.” Instead, he’s laying all the emotional cards on the table. And he starts with a list of questions – HOW LONG, God? How long? For anyone who has ever wondered whether it’s okay to be angry or frustrated with God - this Psalm is a good reminder that...yes, it’s okay. In fact, it’s a normal part of a life of faith. Consider for a moment – your own big, emotion-filled questions. What “How long” would you contribute to the list? Perhaps…. How long will I suffer from chronic pain? How long will I be in debt? How long will my family stay mad at me? How long will I hate my body? How long will I be full of anger? How long will I be afraid for my own safety due to the color of my skin? How long will we live in such a polarized world? How long will we wake up every morning to images of dead and bloody bodies? How long will we live in world of fear and retaliation? How long will we have to explain violent acts to our kids and grandkids? Psalm 13 is raw and real and timely. We don’t know who wrote it, and we don’t know any of the details of his or her life experiences at the time it was composed. But we can gather that times were rough. The author of this psalm was at rock bottom. That is not unfamiliar territory in any life. We all have stuff. And sometimes our stuff is big and heavy and pulls us way, way down. When we’re going through it, life can be really, really hard. Life can be so hard that we feel forgotten. His feelings are as relatable today as they ever were...individually and communally. Rock bottom is a painful place to spend time. I’ve been there. And I would imagine that in some way, you have, too. It’s the worst. And the Psalmist describes it well. In stepping back, we can recognize that Psalm 13 gives us a comprehensive look at resilience and perseverance. In exploring this Psalm - we gain some insight into what it means to be a faith community and a world who perseveres, too. A world who feels big feelings but doesn’t get stuck there. The author of Psalm 13 didn’t have the benefit of the APA or the brochure, but on some level, he understood resilience. He expresses big feelings and he doesn’t deny them. He doesn’t deny the reality he is experiencing. And then – he puts everything that has happened to him back into some sort of cosmic perspective. The author of Psalm 13 continues functioning. He finds a pathway to persevere…even though the well was really, really deep and he was at the very, very bottom. Psalm 13 is less a Psalm about the qualities of God – and more about the experience of being human. It’s about a human figuring out what it means to have a relationship with God while being on this planet...experiencing all the highs and lows that go along with being here. Part of being here is experiencing extremely difficult challenges and really strong emotions. And part of being here is learning how to manage those emotions. We don’t know how the writer of Psalm 13 was able to process the reality he faced...but somehow he made the leap from verse 4 to verse 5. From despair to possibility. It’s important to note that we don’t know how long it took to write Psalm 13. There’s nothing that says it was all in one sitting. Maybe he wrote verses 1 to 4...those verses of deep lament and questions and pain...and then took a break for a week. Or a month. Or a year. Or a decade. We don’t know. It’s the same in our own lives. The journey from despair to possibility sometimes takes awhile. Sometimes we can see a bigger picture right away. And sometimes it takes so long. The journey from raw, bitter frustration with God to eternal trust and praise has no set length. And it can happen any number of times over a lifetime. As a congregation - we are created to be a place where people get to come and be...wherever they are at on the journey. This isn’t just true of churches. This is true of our homes and our families and our kitchen tables...following Jesus means being with people wherever they’re at on the journey. Whether they’re at Verse 1 or verse 5. Or the space between. We walk together. We make space for people to feel what they feel. We prioritize listening. Deep, sincere listening. We don’t have to solve it all. Earlier this week, Presiding Bishop Eaton said in a statement, “In the days ahead, we must consider how we might join together, and with ecumenical partners, to dismantle systems and structures that perpetuate hatred and violence in church and society. But in this moment, our calling is to a ministry of presence. A ministry of “showing up” with each other and especially with the members of our congregations and the people in our communities." This is really important: We don’t have to solve it all. We start by just showing up. Sometimes we just want to fix it all so badly. We want to give advice and answers. But as for the writer of Psalm 13 - his friends could not fix it for him. They couldn’t answer the questions. God didn’t answer either. But in having space to vocalize the questions and the wounds...there was healing and forward movement. The same is true in our lives. We don’t have to fix other people’s broken hearts. We can’t dismantle all the systems and structures at once. We start by setting our judgments aside so we can be present and listen and accept each other. Walking side by side. The Psalms are individual and they’re also collective. They give us a collective voice. 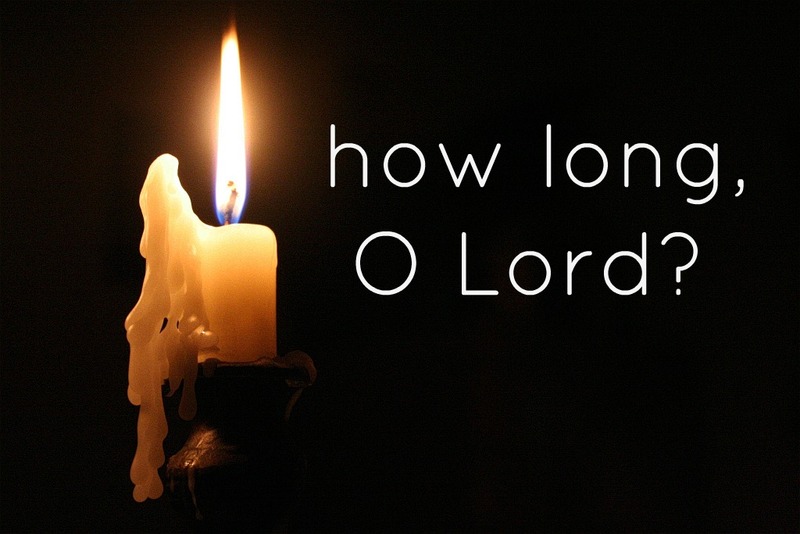 When we’ve run out of words...which is where many of us find ourselves this week...we open to the words of this Psalm and they make sense….HOW LONG? How long? How long? And so we keep walking together. Side by side. Making our way toward the hope of verses 5 and 6. Looking for glimmers. Anticipating healing. Believing that even if we can’t yet read the music - there will again be a reason to sing. Thanks again, Em! I even added your closing sentences to my collection of great quotes.